Mayse received his B.A. in Studio Art from Salve Regina University in Newport, Rhode Island 2008. After graduating he pursued work in the action figure industry both designing and sculpting figures for Mattel and Hasbro from various toy lines including DC Universe and Star Wars. In 2011 he returned to school attending the MFA program at Cranbrook Academy of Art until 2013. Mayse has shown in New York City and Northern New Jersey, and his work is part of private collections throughout the Unites States and Europe. 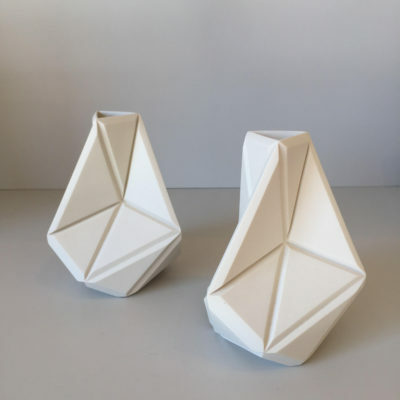 In the new work, Vessel #1 (featured), Mayse explores the intersection of contemporary digital design language and the utilitarian. 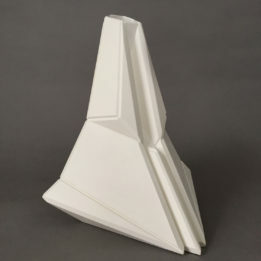 The proposed aesthetics borrow the plane and the line from digital mapping media, but formally is based on elements of the classical Greco-Roman vase. These elements have been broken down, faceted, exploded, and reassembled in an attempt to understand and reimagine traditional pottery.